We slept fairly well with only one truck coming close to the RV all night. I shut the window and fell asleep again. We were driving by 7:30AM this morning with a coffee each. Sadly the bumps in the road made it impossible to take a sip of the hot liquid. There were road patches here and there but it was still bumpy. But better patches than none. We used to leave the Isla at first light around 5:40AM and drive all the way to San Carlos in one long 12 hour day. We don’t anymore as the road is so bad. This way we can take our time and drive as slow as needed. Corn as far as the eye can see. Lots of tolls today. 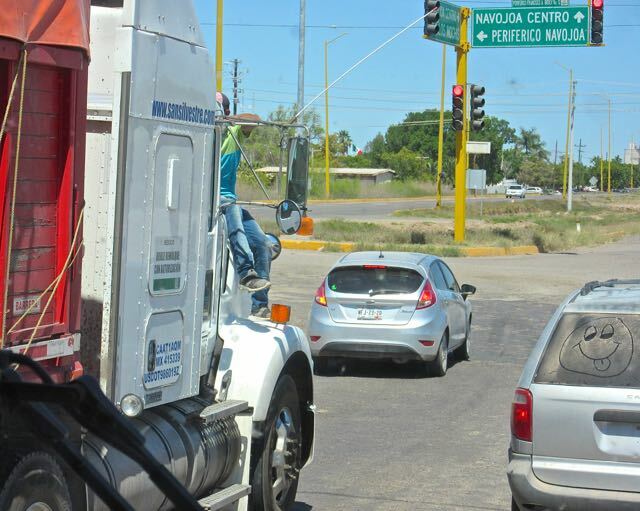 The one just before Los Mochis charges by the axle and as we have four including the Jeep we are towing we paid 210 pesos. A year ago it was 200 pesos and in March of 2010 we only paid 144 pesos. So handy having my travels notes on the travel log I use as one of my navigating tools. 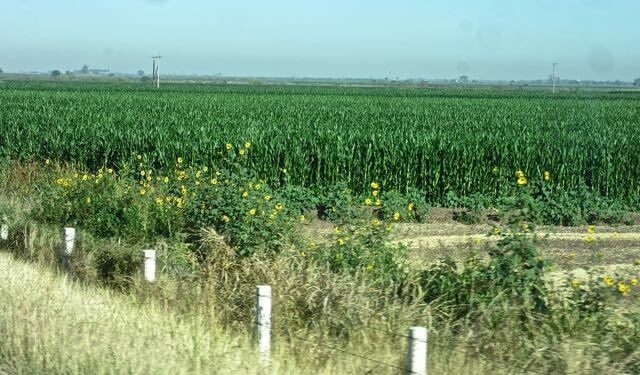 The agriculture check before Los Mochis at KM 124. No apples, oranges or pineapple but limes and bananas are allowed. We slowed as we entered the area and the fellow waived us to the left where the spray jets are. We just kept driving straight and he let us through after checking that we only had bananas. However I think that next time we will try and go through on the extreme right. As we left the little booth area we had these huge craters to waddle through and it was not pleasant. The exits on either side of our lane were smooth hence the reason to try and take the one on the right. If you go left then you likely will have to pay 100 pesos to not get your RV sprayed, if they will let you do that. You don’t want get your RV sprayed. Much of the details in this post are for those coming after us, both from Las Jaibas and from Tres Amigos RV Parks. We have left early this year for us, so it is only fair that I share my findings to help those following behind. 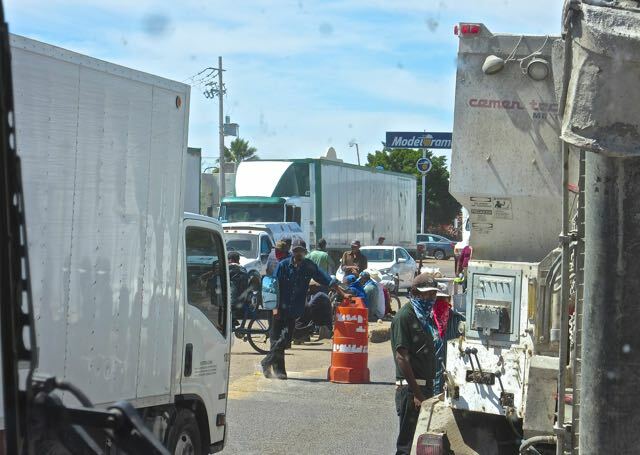 If you are leaving the Isla and stopping at Smart Gas just before Los Mochis it will take 6 hours and 10 minutes of driving time. Some construction around KM 175, slow going and bumpy but only for 2 kms. 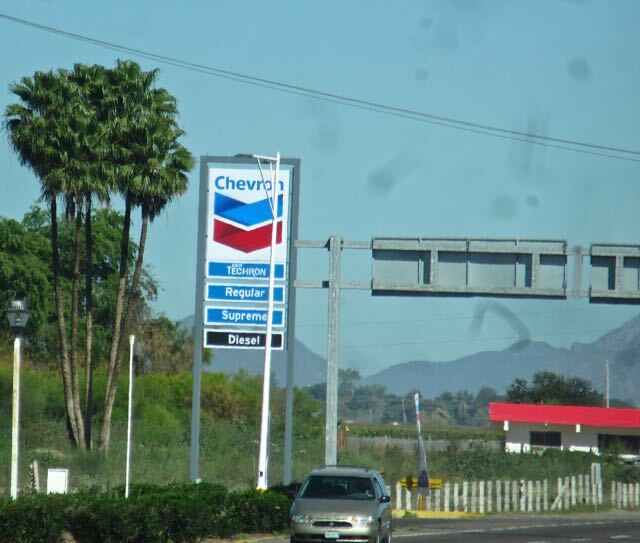 We were amazed at how many Pemex stations have been taken over by Chevron, Gulf and others. We stopped for fifteen minutes for Colin to get a muffin and another coffee. Meanwhile I was suffering from dry eyes and I neglected to get my sunglasses on fast enough. A cold wet facecloth helped with the burning and the tearing and eyes drops calmed it all down. But it was bad enough that I couldn’t open my eyes for about 20 minutes. Crisis averted. 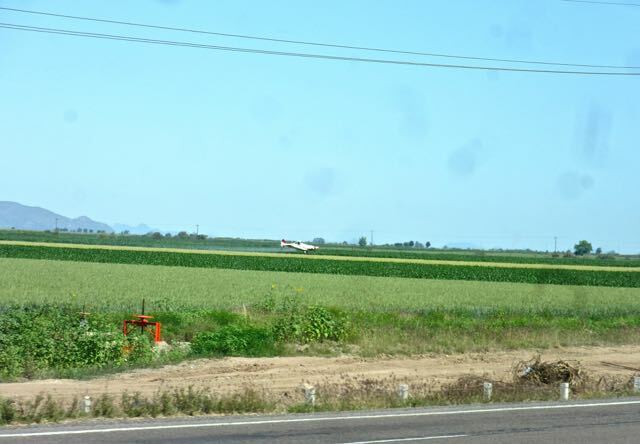 Another crisis averted was this white crop duster. He was flying very low coming towards the highway. It looked like he was going to go under the wires when he suddenly pulled up and spiralled. We nominated him for the idiot of the day award. 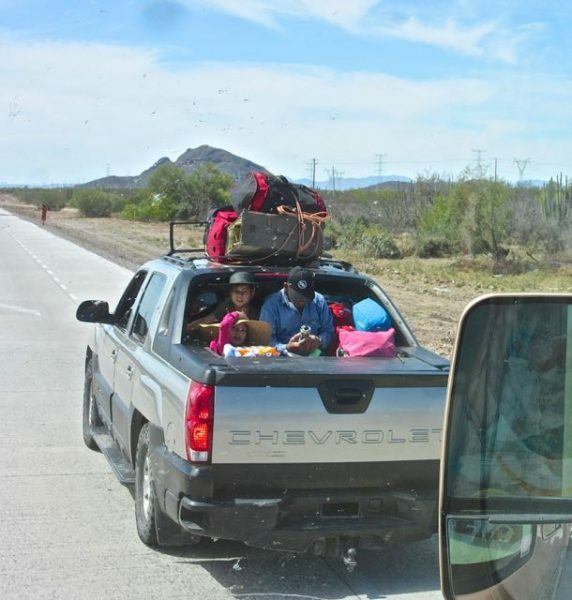 We were boarded at the second agriculture check at the Sonora border. By the way, go to where it says truck ( there is no longer signage saying autos ), do not go where it says autobus. We said we only had bananas but the officer had to come in and look at the bananas in my fruit bowl. At no time did he look into the fridge to check what I had in there. Once you leave the agriculture inspection area you approach this. Enter close to the right of the arch, less potholes here but still enormous ones, think bathtub size. You will need to literally crawl through here. Those who experienced this last year and thought it horrific will not believe how much worse it has become. 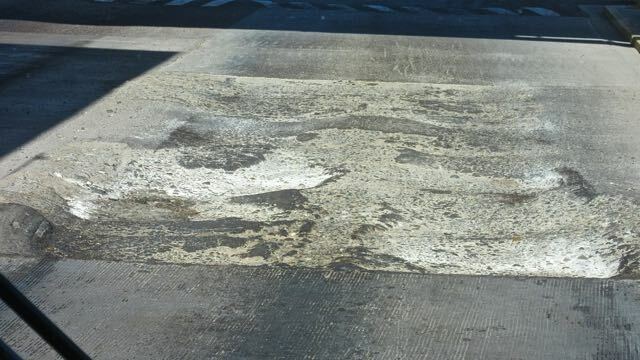 It will take several minutes to sway and bump your way out of this pothole field. Your reward is a lovely new cement road but only for a few moments. Between the dust spots and the bugs on the windshield my photos are pretty spotty. Now begins the first of 5 desviacions/detours. That means 10 of these cross overs. However the first 3 sets of these are not easily done. Pay attention and watch for the drop offs and craters. The 4th set was tolerable and Colin said that the 5th set was civilized. So approximately 32 miles of back and forth and then a good 50 KM of road to Navajoa. Between the 4th and 5th detour was an obvious drug stop. Trucks and cars were being checked, inside, under the hood, in the trunk and even the wheel wells. After a 10 minute wait we were first in line and the fellow walked away to look at the tire area of a car he had pulled over. Rather than wait, we just moved on. No one came after us. Can you spot the guy washing the semi’s windshield? We always drive through Navajoa, except last year to check out the detour. It is way too long and there is no law that an RV can’t drive thru the middle of town so we do. Still much quicker than the detour. It is always interesting to see what is happening and we find the slow pace a nice break after highway driving. 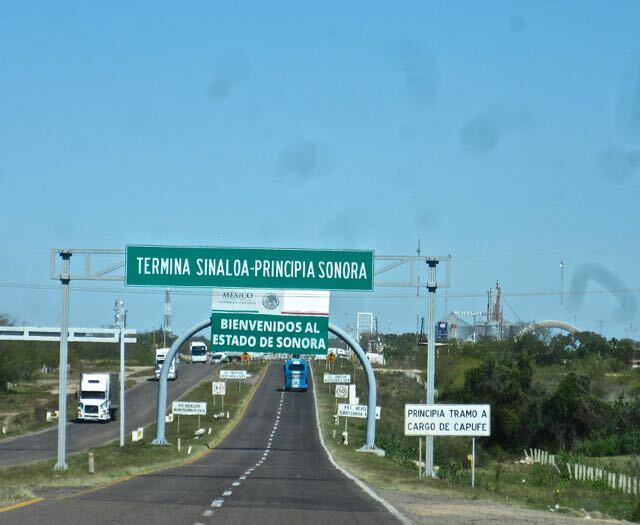 Most Sonora tolls are being charged again except the one right after Navajoa so we saved 227 pesos. 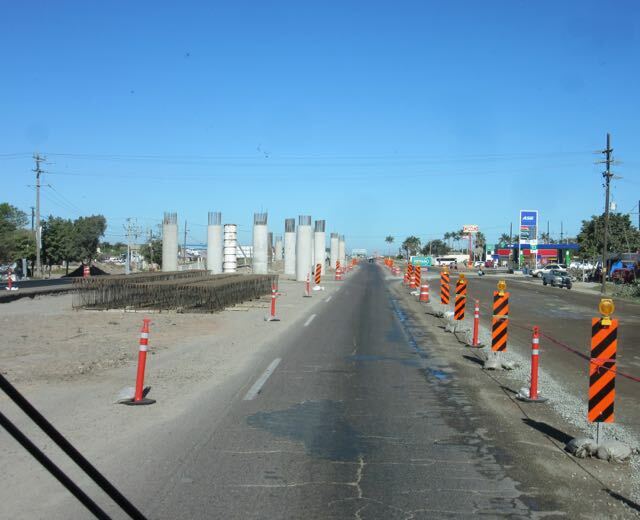 Just past the toll booth at km 202 is the sign for the Guaymas quota, essentially the Ciudad Obregon bypass. It was along the bypass that we saw a small European RV driving south. 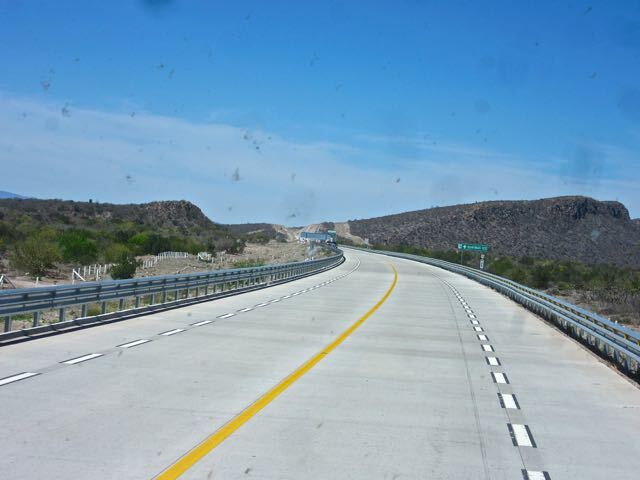 The bypass is 35 kilometres and takes 25 minutes to drive. The toll is again charged per axel and our cost was 318 pesos. 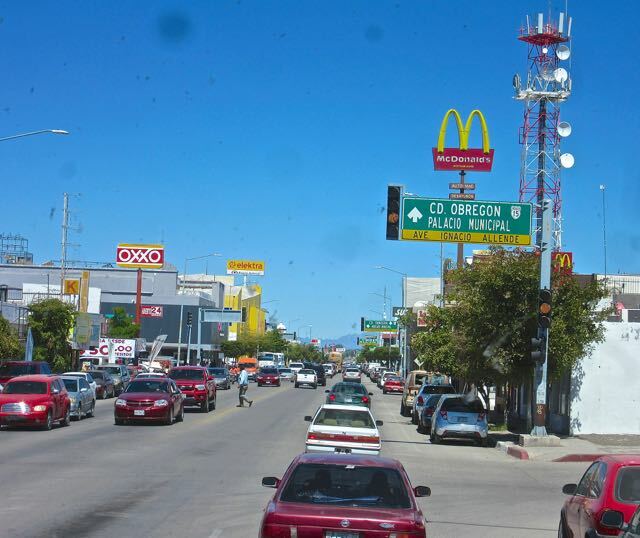 Well worth not having to deal with the headache and bad roads of Ciudad Obregon. It was as we got off the bypass that I realized that we had a problem. 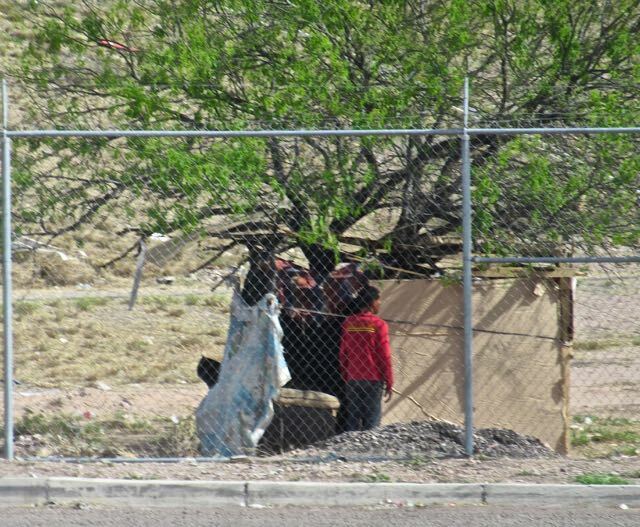 We had not stopped in Navajoa and now we wanted to stop and make lunch but there was no place to stop. The merge off the bypass onto HWY 15 is north of the last big Pemex. There was no place to stop until Vicam. However Vicam is not exactly a good place to stop but in hindsight we will do so in the future. As we continued north there was still no place to pull over. We just did not feel comfortable stopping in Vicam but it is the only place to do so. 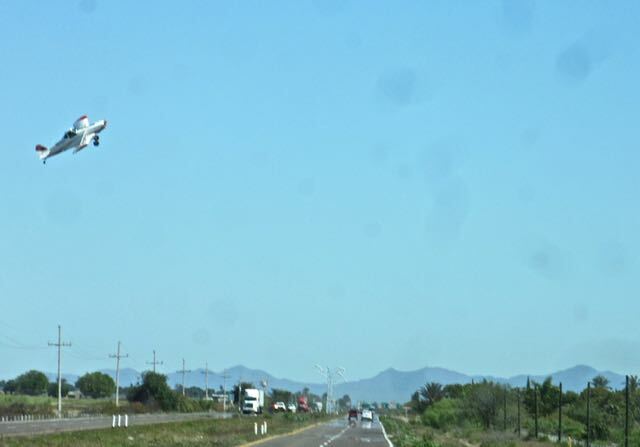 I can’t believe that there is nowhere to stop between Navajoa and Guaymas. In the end because the road was new and smooth, I managed to get up and make a quick sandwich for lunch. This was a full load. Three in the bed of the truck surrounded by stuff and three in the front and at least four in the back seat. 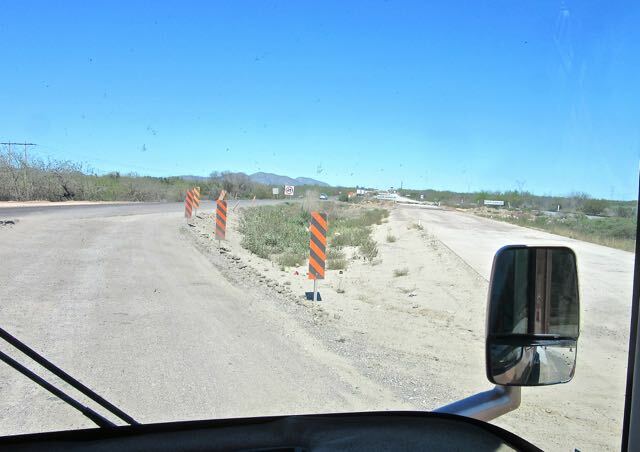 The turn off to Hermosillo is a bed of holes and difficult to manoeuvre. In order to get to Totonaka RV Park in San Carlos you have to drive through the new Flecha Gas station which happens to also have a large fenced in ( on asphalt, not dirt and just a bit of dust ) overnight area. We looked at each other and said why not. Audrey had recently reminded me that I can always use my iPhone hotspot with my Telcel package to post a blog. I just keep wondering when my data will run out. I only got the 100 pesos package last week. Guess what? We have a squatter just over the fence from us. We never plug in at Totonaka because of the bad electricity so why spend 420 pesos just to get a receipt for our out of country vehicle insurance. I will use something else. The cost to park here was 50 pesos. We drove 309.6 miles today. That only took us 7 hours and 4o minutes. Last year it took us 8.5 hours. 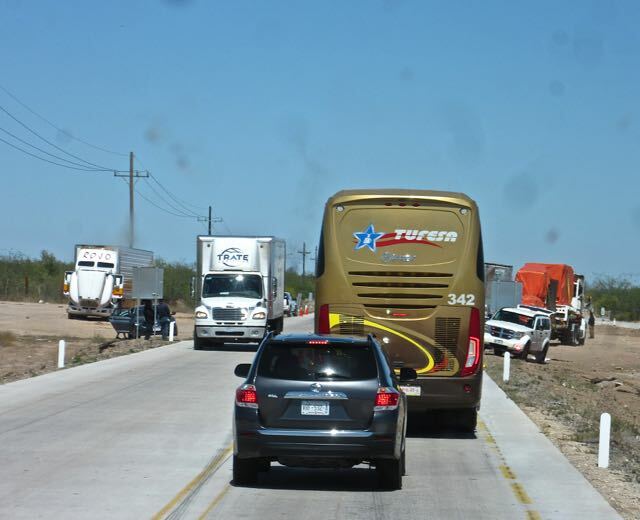 The better roads along with the Obregon bypass far outweigh the bad roads. Every year the roads are getting better. Not much of a sunset tonight. 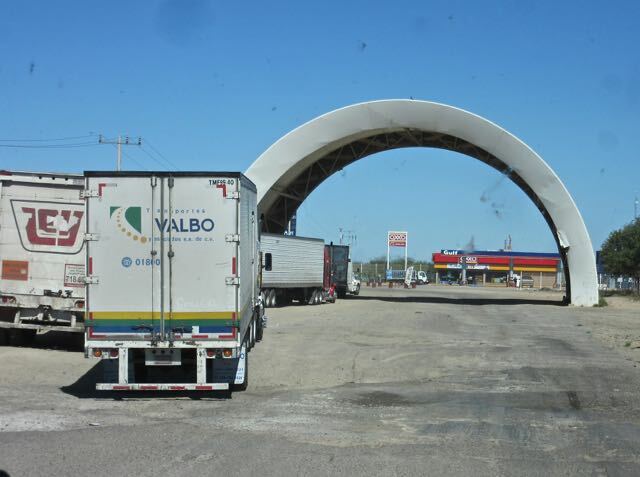 As you can see we parked as far as we could away from where the semis might want to be. 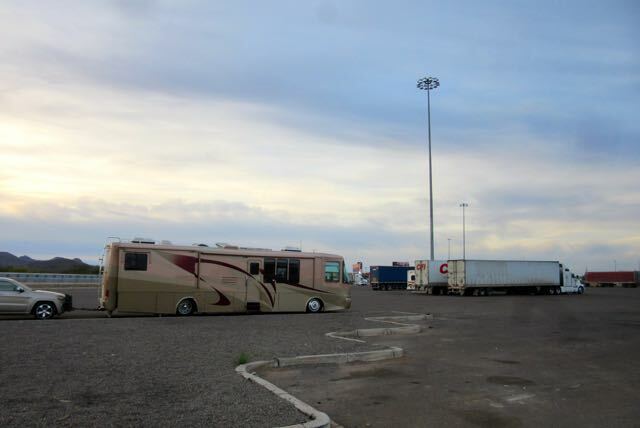 When we arrived there was another RV here and it now has a semi on either side. Thanks for all of your comments. Always appreciated. I have been at this for just over two hours. Time for a break from bouncing around in the RV and from posting. I need to rest up, tomorrow will be our longest driving day of the trip home. 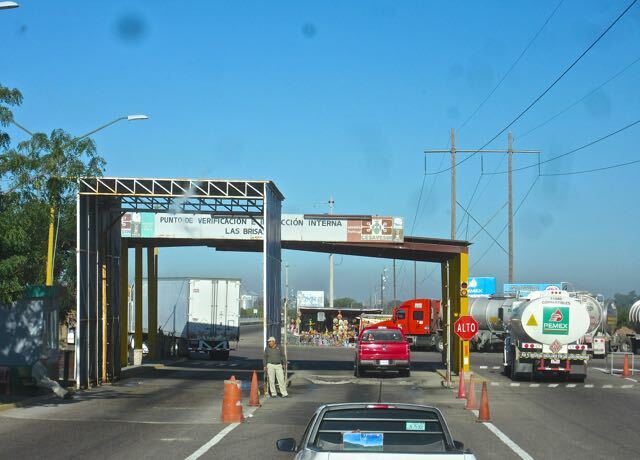 Tolls have gone up in terms of the peso. In dollars, I think there is very little change. Good pics from a road trip. Be safe and have fun. We Canadians count pesos and Canadian currency, not dollars as you call the US currency. To us it is an increase of money out of our pockets. A good travel day and you are making decent time. carry on and safe travels. Thanks George. We are doing well and not feeling pushed at all. Sounds like some busy, busy days. Continued safe travels. We are safe and sound in the US. Busy yes but happy to be able to do it. Colin really need that food 🙂 As to the rest of the trip, read the next post! The picture with you folks in the last parking lot, the rig looks very low, do you have air to lower it when parked?..Maybe it’s just the picture? It’s been very warm here up north and the snow is becoming invisible..Must be magic..eh? Yes, the RV has air bags which we deflate at night and re inflate the next day if we are travelling. Invisible snow is magic to my ears! We are following closely your trip north. Those bath tub deep potholes just after the dome structure were something else. That was a great call to o’night at the Flecha gas station. You lose a lot of time going into Totonaka then out again and pay them for basically dry camplng on the road in the park. At Vicam they demanded 50 pesos from us. I said no way. We handed the guy (wearing a bandanna over his face) 20 pesos and he got mad. We drove on and at the last minute they pulled the plastic barrier out of the way.